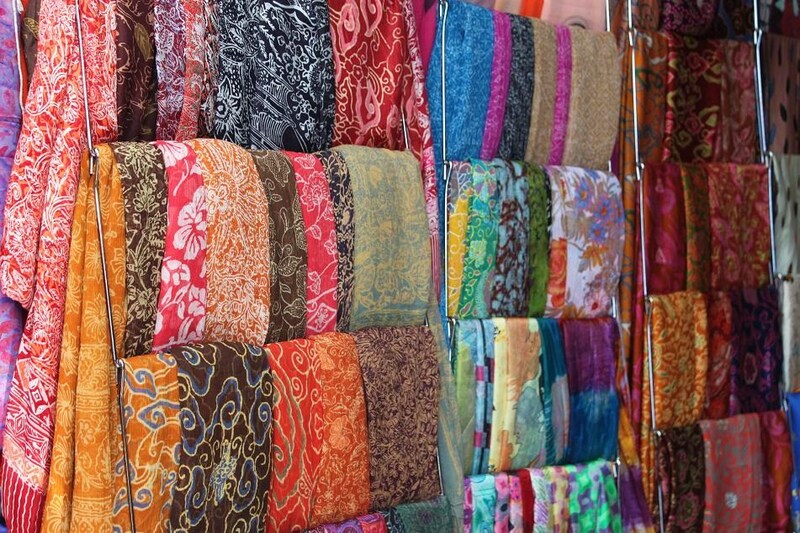 Feast of Colors at Ubud Market | What an Amazing World! Apart from picturesque landscape, Bali also offers rich artistic and cultural experience. From all places in Bali, many people find Ubud as Bali’s art and culture center. Everywhere you go in Ubud, you will find art galleries and workshops at every street and every corner. Usually when I travel I never put market as a priority to visit. Neither did I during my recent trip to Bali. 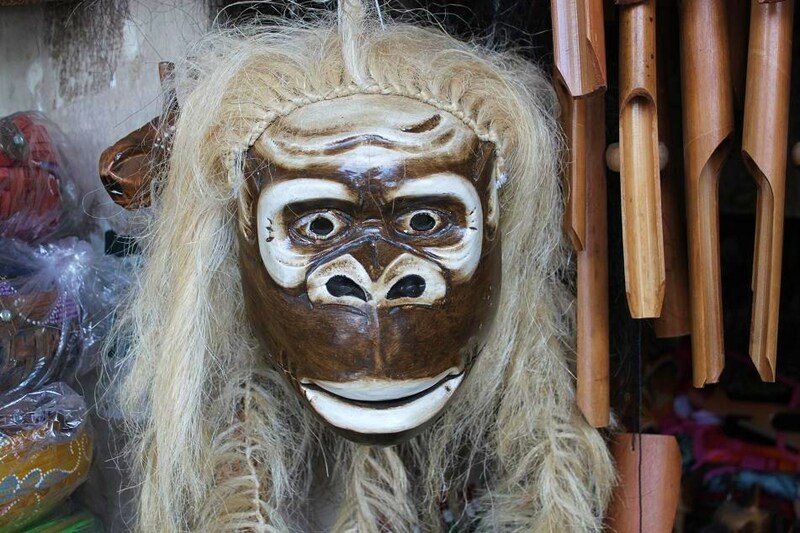 However, that day on my way to Tampaksiring and Kintamani regions (stories on both places later in this blog) my driver took me to Ubud market. Unlike many tuktuk drivers in Bangkok who often lead tourists to a market in order to get fees from the store owners, my driver seemed genuine and he brought me there simply because many people like this place. At first I was reluctant when I got off the car and walked towards the market. I was thinking “What? A market? What am I doing here?”. But the moment I walked into the market, all the doubtful thoughts just disappeared right away. The market itself is quite small in size, but even so, I was overwhelmed by the selection of colorful artistic souvenirs in every stall. 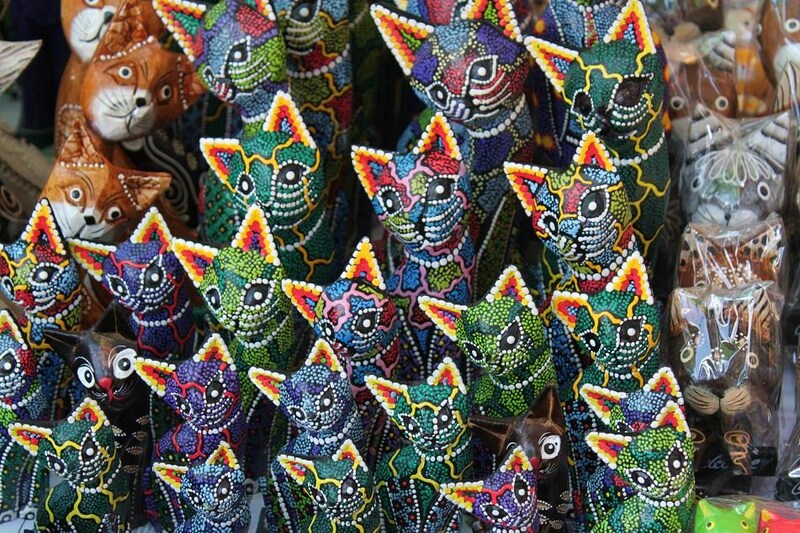 Not just souvenirs, for fashion lovers, this place also offers abundant choices of colorful traditional cloths and accessories. In just seconds I went from being skeptical to an enthusiast. I searched for a small sculpture of a rooster because my father is a big fan of roosters (and I am a big fan of eating them!). After searching over and over again, I could not find any rooster souvenir. Hence I did not buy anything at all. Tired of going from stall to stall, I decided to look around and found a small temple (yes, temples are everywhere in Bali!) 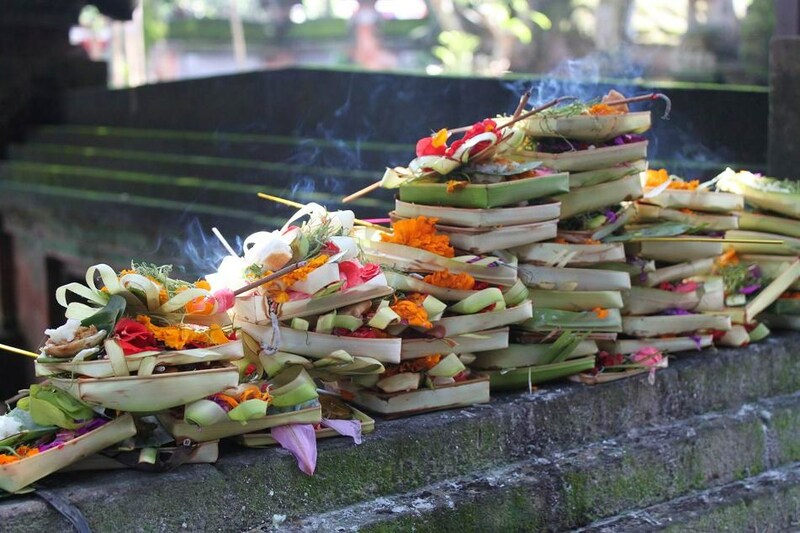 full with stacks of Canang Sari which is believed by Balinese as a tool to avoid bad things from happening. Burned incense filled the air around the temple and there’s a somewhat peaceful feeling for just looking at all the activities inside the temple. 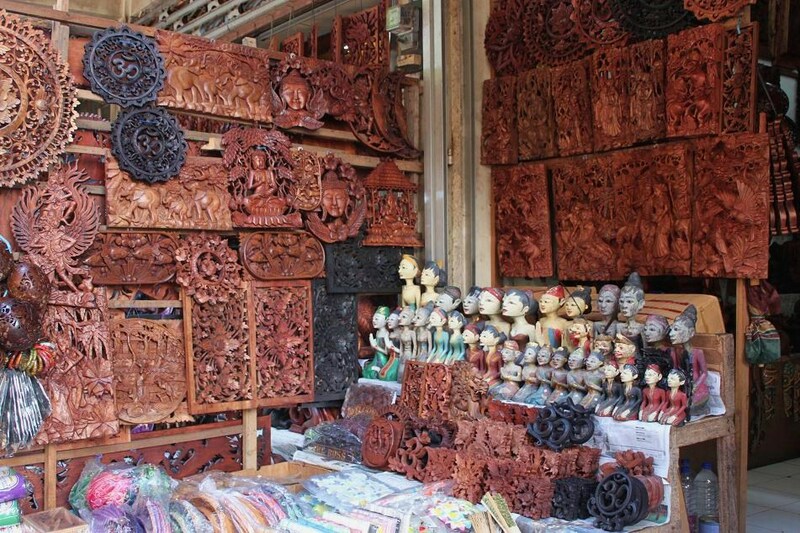 If you are not in rush and would love to look around for souvenirs right in the heart of Balinese cultural center, then Ubud market might be the place for you to go. Oh, and don’t forget to bargain for the best price! Awesome shots! I love the colors. But you have climbed Mt Batur. That is something, man! So that’s what all them flowers are called! Canang Sari … Cool! Yes and the Ca- is pronounced Cha- by the way. A beautiful set, Bama! 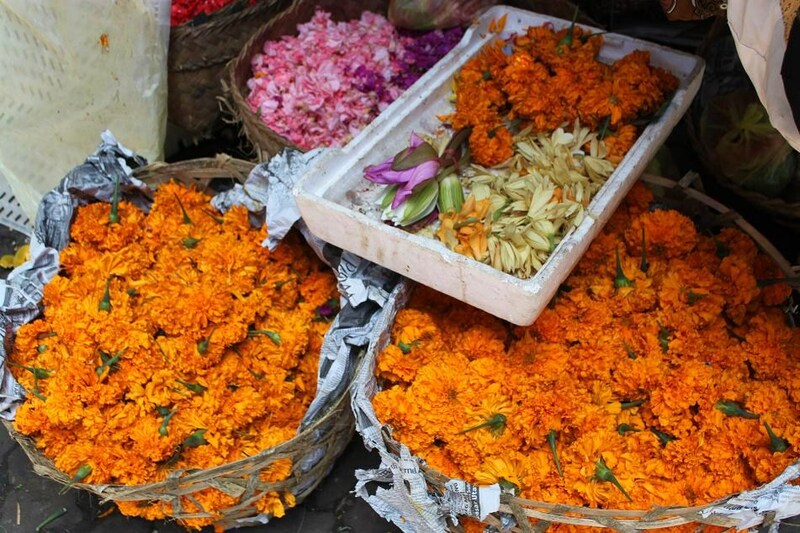 We spent several afternoons strolling this market while in Ubud. From the batik silk, to the woodcarvings, there are so many handmade details in which to delight. Makes me want to go back! And thanks for reading! 🙂 Ubud market is one of my favorite places to explore in Ubud. It’s just so colorful.